I finally went to Bar Taco. It is located in the Hyde Park area of a city that I find myself visiting quite often. Tampa! Thanks to one of my fav food blogger, Quin of Butter Be Ready. I first met Quin at Blog Her 17 in Orlando and we've been hanging out ever since. She's also a guest food blogger here on my blog. We were extremely disappointed. I was big mad y'all. I started backtracking wondering what did I do to deserve this non tasting food. My taste buds were not happy at all. The dish I had was a bit pricey so I had every right to be in my feels. After we left, me and Quin were talking mad ish. We came to the conclusion that they must be paying to keep the recognition going. It was the only thing that made sense to us for the disappointing meal we had. Here's a foodie tip: Don't always believe the hype of the "best of the best". Now on to my review of Bar Taco. This place happens to be Quin's favorite spot. She recommended it for our next foodie adventure. Once I started to place my order, Quin suggested that I try the pork belly taco. I wasn't so sure at first because I tried pork belly before somewhere else and didn't really like it. But I ordered one anyways. I was sure I wasn't going to like it. Boy was I wrong! Can you guess which one was my absolute favorite? Yeah, the pork belly. I was like dang!!! I should've ordered more. It was ridiculously delicious with tons of flavor. I kept saying ummm with each bite. The fried oyster came in second for me. As a food blogger, I usually tend to take what I eat very seriously. I annoyingly go the extra mile to review restaurants and obsessively narrow down only the top spots. Well, when I moved to Tampa I just had to check out a spot called Bartaco. With reviews such as "best tacos you will ever eat in your life" and "mouthwateringly delicious", I had high expectations of this place. Bartaco is tucked in between Hyde Park Village and surrounded by lots of cute little shops. Their spot is cozy and inviting with the staff hustling and bustling in their navy and white attire. Unless you go on a non-busy day, like during the week maybe you'll have to wait a bit for a table. And for this place, the wait is worth it. Once you're seated, you'll be greeted by a friendly, young, and attractive waiter who helps you place your order. On my first visit I had no idea what I was in for so the waiter kindly recommended their usual faves and must try's. 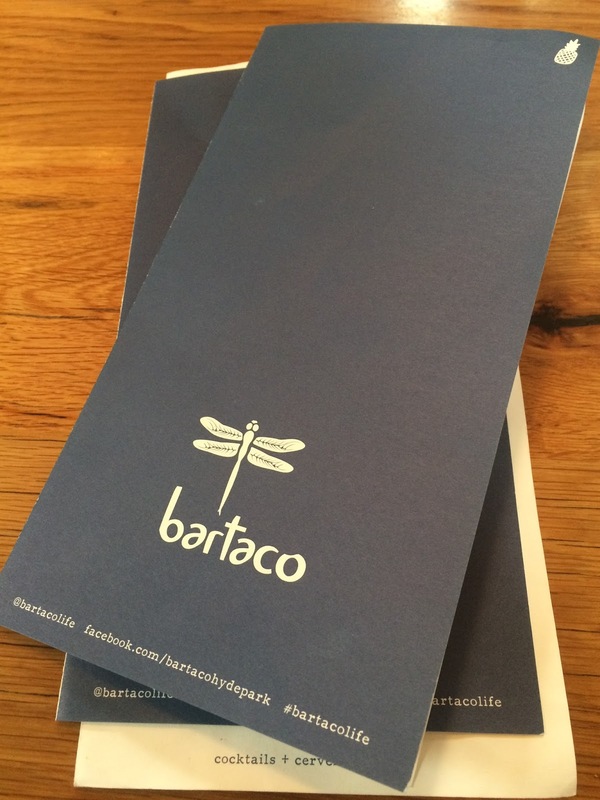 I've since been to Bartaco more times than I can count and of course I have to relish in my top favorite eats here. Let's start with the obvious... the tacos. Since I don't eat seafood the pork belly, sesame ribeye, spicy chorizo, and the pork pastor tacos all highly appealed to me. All of their tacos are small with about 2-3 bites per taco so be prepared to order about 5-6 if you're coming with an appetite. But I must take a moment to tell you about my all star favorite... the pork belly taco. This baby is loaded with flavor! Juicy, tender, and insanely delicious pork belly paired with a sweet glaze that will have you licking your fingers. This one is hands down my favorite and I usually order at least three. I also typically order their house made guacamole which is another hit at this place. I'm a huge fan of their grilled corn, on or off the cobb with cayenne pepper, lime juice, and cotija cheese. And lastly, the sweet plantains are bomb as well. Each time I go, I try to order something new to try and so far I have not been disappointed. This place is amazing from start to end with great service, delicious food, and nice atmosphere. 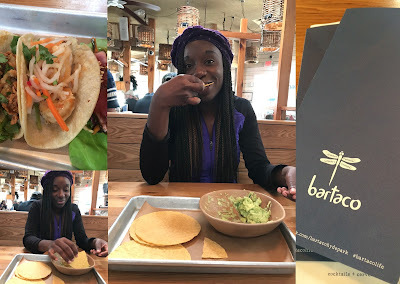 I'd highly recommend you get to Bartaco as soon as you can! Yeah... what she said. Now if you excuse me, I'd like to go back to eating. I will def be going back again and again.